Karma relaxing in our back yard. This is our Aussie "Karma" she will be 2 in July. We are planning on getting a blue boy hopefully this Sept. He will be a half brother to Karma (same mother different father.) She has been a joy to us and since we lost our Sheltie "Lacy" in Oct. we have been figuring on getting her some company and a playmate. We have two Aussie's - one is a mini and one is a toy. 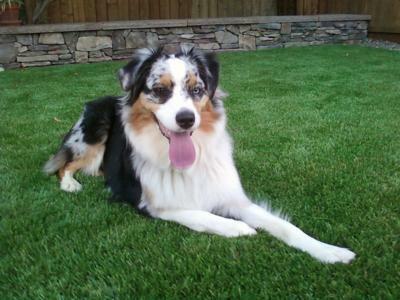 I know that my Aussie's are not considered Australian Shepherds. But I can say without a doubt that two will have so much fun with each other, it will keep you entertained. Ours play so hard that they sound like they are going to kill each other. They break apart and look at you with huge grins. You know they are saying "I'm having a blast!" We love them completely and can't imagine life without them.